I used a willing guinea pig (me!) to find out. “What stops bacteria and viruses in their tracks?” This question is probably getting asked pretty frequently this month, but it seems the answer is elusive. Everyone has their tried-and-tested cold and flu remedy, but surely there must be a go-to supplement that’s been proven to always keep you fighting fit, or get you quickly back into good health. At Nutrition with Nina I chat to client’s concerned about their health, I also see a steady stream of customers at the health shop I manage, and I keep up to date on the latest supplement research. I decided to accept this January challenge and figure it out. Then, things took a turn for the worse. 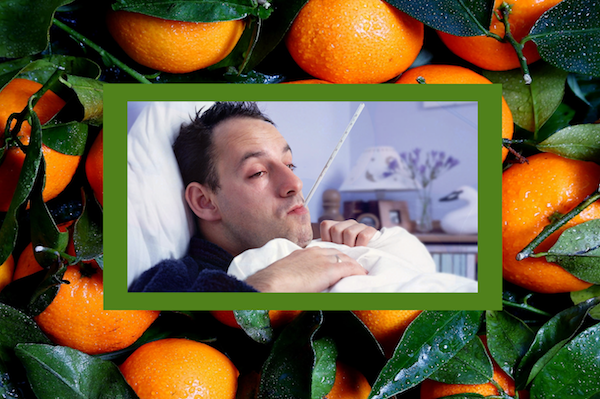 After having the odd sniffle at Christmas and New Year, I eventually got laid out in January by what felt like the flu. When it felt like even my eyelashes ached, I put on thick socks, jogging pants, legwarmers, a thermal vest, jumper, a hoody, and finally a hat – then took to my bed to sweat it out. One hot night and my fever had broken and the aches were gone. One day of listlessness and Netflix and I felt more like myself. One more day and I was ready to wrap up warm and venture out for a walk (I got back completely energised, and made chilli, baked bread and was dancing in the kitchen when Mr S got back from work). Now all that’s left is a cough, so I plan to take it easy when I head back to work this week. Of course, I was also armed with some key supplements, and I was quite enthusiastic with the dosages. ‘More’ is not always ‘better’, but in acute instances like this I personally prefer to support my body with higher amounts of nutrients than you’ll usually find in the diet. With that in mind, I think it’s time to spill the nutritional beans, and walk you through what was on my bedside table and why. I know about olive leaf, historically used by the Egyptians and Europeans. Its extract is a source of phenolic compounds such as oleuropein, which has the active ingredient elenolic acid. Research indicates this multi-tasking acid inactivates viruses, dissolves outer cell walls of bacteria, and stimulates the natural immune system. I also know about andrographis, the bitter Asian plant, which provides andrographolides to stimulate the immune system and increase the production of bacteria-munching macrophages. But ARA-Larix? A complete mystery! Turns out it’s an arabinogalactan, a non-digestible fibre primarily from larch trees, which ferments in the digestive tract. It might whip your natural bacteria into shape. It might directly stimulate the immune system via the lymphoid tissue in the gut. Either way, ARA-Larix increases levels of natural killer cells, and decreases incidence of colds by a massive 23%. Zinc, vitamin D, and vitamin C are three of the big hitters when it comes to vitamins and minerals which strongly influence the immune system. Of course they were all on my list. However, vitamin C is a little tricky. Most of the time you reach for ascorbic acid, but this is just one piece of the nutrient jigsaw which is vitamin C. When you take ascorbic acid you still need to find all the other elements to compete the whole picture, and make a useful nutrient. Why add on this extra pressure when your body is already trying to fight against bacterial or viral attack? My personal preference is for a completely natural supplement, sourced from a whole food. I have Royal Green’s Camu Camu with vitamin C. Down it went. Who doesn’t love echinacea? Whether in teas, tinctures or tablets, this pink-petaled plant regularly features in cold and flu remedies. It inactiavtes the enzyme that helps bacteria to spread, and also supports both humoral and cellular immunity, meaning you produce more leukocytes to fight the good fight. Combine echinacea with sage (which offers broad spectrum anti-bacterial and anti-inflammatory properties) and what do you get? The perfect one-two-knock ‘em dead throat spray, that gets straight to the spot. So what’s the final conclusion in this search for the ultimate flu-fighter? As I suggested earlier, everyone has their personal favourites. However, I detest being unwell and don’t want to just sit and wait to recover, so instead I’ll use some key nutrients to give my body a helping hand. The beauty of our immune system is that there are a multitude of mechanisms and cells which together help keep us protected. Which means that support can be provided in more than one area. Antibodies, mucus membranes, lymphatic tissue in the gut, natural killer cells, macrophages, you could give them all a little love. For me, this motley collection of herbs, vitamins, minerals and probiotics certainly gives it a go. For now, they’re my perfect remedy.